I work at a school for kids ages 4 to 14, so when Jerry Remy selected me to be Vice President of Red Sox Nation (after I placed second in the presidential election), I immediately began brainstorming ways to bring “Red Sox love” to the students, teachers, and staff at my school. 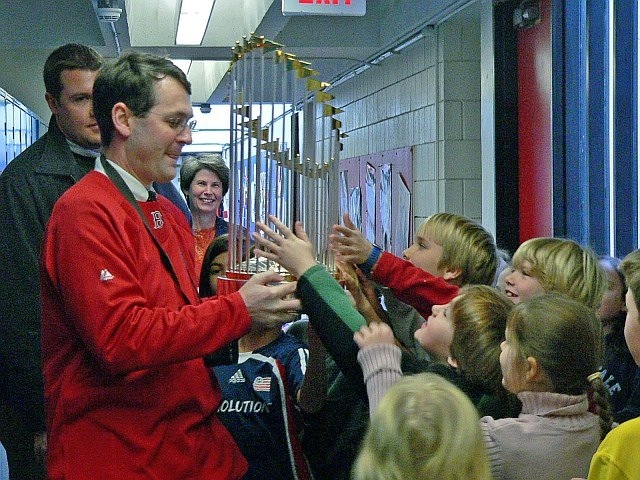 I like to think big, so I asked the Sox if I could have the World Series trophy for a morning. Miraculously, they responded that the trophy would be between other engagements and in my school’s area on a certain day, making it available to me and my school for perhaps 45 minutes. Unbelievable. Posing for one particular photo, I put my arm around a member of our school’s maintenance staff who was holding the trophy, and his whole body was shaking and trembling uncontrollably. Other adults at the school were moved to tears when they finally cradled the trophy, and the smiles in their “trophy photos” express a wild combination of bewilderment and joy. The World Series trophy’s mass consists of all the emotions of the season, as experienced by every member of Red Sox Nation. It includes the “mass” of the emotional roller coaster every fan experienced during the Mother’s Day Miracle” on May 13, when the Sox scored six in the ninth inning to beat Baltimore, 6-5. It includes the “mass” of the stress every fan experienced as the Yankees inched closer and closer to us in the A.L. East in August and September; it includes the “mass” of the emotions every fan experienced when Manny connected off of K-Rod for his walk-off homer in game 2 of the Division Series. And it includes the “mass” of every fan’s emotions at the moment Bobby Kielty hit his pinch-hit homer in game 4 of the World Series (pictured here). All these emotions from the 2007 season – and every emotion that occurred between these games, from every fan around the world – are contained within that 2007 World Series trophy. That’s a lot of “emotional mass,” and it helps account for the fact that the trophy has the gravitational force of a moon. And the 2004 World Series trophy? Well it has the “emotional mass” of 86 years of Red Sox fan experiences crammed inside it. Only a Cubs trophy will ever come close to matching the “mass” of that baby….. This entry was posted in A+ Articles by Regular Rob, Baseball, Children, Red Sox Nation, Sports. Bookmark the permalink. Absolutely brilliant. Possibly your best of many many outstanding blogs. Don’t know how you find the time to do this wonderful stuff with 5 kids. On the other hand, without all the kids, there might not be the understanding of why it is so incredibly important to write down these deep, beautiful, and finely crafted insights.